Beam Global Spirits & Wine, an international spirits company, said that its whiskey brand Knob Creek has introduced its first-ever single barrel bourbon, Knob Creek Single Barrel Reserve. The spirits company said that the new Knob Creek Single Barrel Reserve is naturally aged for a full 9 years in new, charred American Oak barrels and bottled at 120 proof (60% alcohol by volume). Each barrel of Knob Creek Single Barrel Reserve, once hand-selected, is said to be cut with water and bottled individually in order to preserve its flavor profile. This process allows for variations in taste, color and aroma in each batch of bourbon. This new bourbon features vanilla, caramel and smoky notes. 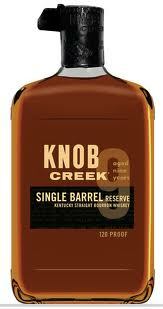 Knob Creek Single Barrel Reserve is available in limited quantities and retails for a suggested price of $39.99 for a 750ml bottle. Beam Global Spirits & Wine bourbons US director Rob Mason said the company is especially thrilled to introduce its first single barrel bourbon offering, and to further strengthen our already-established credibility in the Super-Premium category.